The Southeast Atlantic Marine Debris Initiative (SEA-MDI), in partnership with NOAA’s Marine Debris Program, is pleased to announce our 2011 Funding Opportunity for projects addressing marine debris issues in GA, SC, and NC. Deadline for proposals is 5 p.m. EST on Thursday, January 20, 2012. Awards will be funded for one year and may range from $5,000 to $10,000 with a total of $30,000 available in funding for this solicitation. This competitive funding opportunity is open to investigators in GA, SC, and NC. All work must be completed in these states (or in coastal waters of these states). Scale of projects may range from local to regional within those states. Details are available at our SEA-MDI website: http://sea-mdi.engr.uga.edu/?page_id=204). Questions may be directed to Christine Laporte (Project Coordinator, claporte@uga.edu), or Jenna Jambeck (Principal Investigator, jjambeck@uga.edu, office 706.542.6454). The Clean Marine app is for reporting debris that is too large for you to pick up by yourself, such as an oil drum or an abandoned vessel. Simply install and tell the app what kind of debris you are looking at using my friendly and attractive user interface. Clean Marine will grab your gps coordinates and take a picture for you. All of this information is packaged and sent to SCDHEC to be added to a database of marine debris. This lets the governing bodies know the quantity and quality of debris in their region so they can better prioritize where funds are going. If you are not currently connected to the internet when you spot the debris, your data will be saved and sent when your phone is back online. This app also allows you to manually enter information about a piece of marine debris if you have spotted something and gps’ed it when you didn’t have your cell on you. Who is it designed for and who should use it? 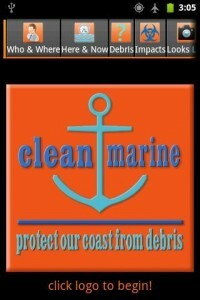 While this was designed to go along with SCDHEC’s Clean Marine program (http://www.scdhec.gov/cleanmarine) and is aimed towards SC coastal residents, I encourage anyone who is on the water to use this application when they see large marine debris and I will make sure your data gets to the proper authorities for your region. In addition, this will let me know how I should progress with development and expansion of the app. Find this app in the Android Market from your Android phone, tablet or computer by clicking (http://market.android.com/details?id=mobsci.cleanmarine) or by searching for “clean marine” or “marine debris”. Also coming soon from the Amazon AppStore. We are excited to have a sister app to Marine Debris Tracker and think everyone should check out this app as well! Congrats on your thesis, Dylan and best of luck in your future endeavors! See the official Press Releases from NOAA and UGA, as well as articles and mentions from others. Highlights include a mention from TreeHugger and the NYT in their greenblog! 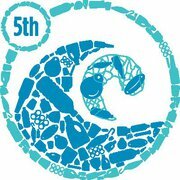 SEA-MDI Staff Member and project coordinator, Christine Laporte, is now at 5IMDC (www.5IMDC.org)! While Jenna Jambeck cannot attend to her duties of session chair and speaker (because of being 36 weeks pregnant and unable to fly that far), Christine has been filling in for her and doing all her own work as well! She is presenting a poster on SEA-MDI. Monday’s session was Innovative Disposal Options for Difficult Situations. Today, she is giving a talk on research conducted by Dr. Jambeck entitled Characterizing Individual Marine Debris Items by Mass. The Marine Debris Tracker App will be highlighted in a talk to be given by Megan Forbes, National Communications Coordinator of NOAA Marine Debris Division on Thursday afternoon entitled A mobile application for marine debris data collection and mapping. And on Friday, Christine will also chair Don’t Fill our Landfills: Alternative Disposal Methods. Christine is also meeting many people and attending all conference days/session. Look for her to say HI if you are there! 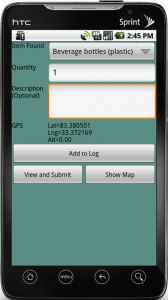 SEA-MDI has launched our Mobile Application, Marine Debris Tracker. The app is available for both Android and iOS platforms (iPhone, iPad, iPod Touch). Simply search for “marine debris” in Google Play or itunes from your phone and download it directly to your phone. Or go here for Android or here for iPhone. For an explanation on how to use the app, go to our website for Android and for iPhone/iPad/IPod Touch. For Frequently Asked Questions (FAQs), including directions on how to log potential tsunami debris, go here. Briefly, the Marine Debris Tracker mobile application allows you to help make a difference by checking in when you find trash on our coastlines and waterways. You can easily track and log marine debris items from a list of common debris items found on the beach or in the water. The app records the debris location through GPS and you can view the data on your phone and submit to the Marine Debris Tracker Website for viewing and download later (requires registration, which you can do from the app). Your username is shown on the website for only the most recent 5 items tracked, but GPS coordinates not shown. All downloadable and mapped data with GPS coordinates is shown anonymously to the public. More information available on the website under “How do I Start Tracking?”. 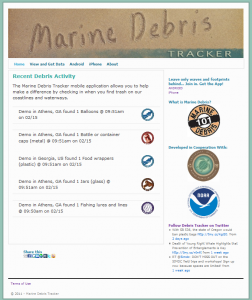 Marine Debris Tracker is a joint effort of the NOAA Marine Debris Division and the Southeast Atlantic Marine Debris Initiative (SEA-MDI) out of the University of Georgia College of Engineering. Marine debris has been, and continues to be, a persistent and pervasive pollution source. Marine Debris Tracker allows for really fast and efficient data collection, which is critical to designing plans to prevent marine debris. Another part of the solution is to get people to even notice (and then pick up) debris. This app is one way we are trying to reach people to have them take notice and then help mitigate the issue… and if you are noticing trash, you are also much less likely to litter (although debris comes from other sources too). While this app collects data (which people can use in various ways to assess the issue), one of the primary goals is to get the app out to educate as much of the public, in a culturally relevant way, about marine debris and its harmful impacts. We have had enthusiastic response to our consortium invites! Newest members inlcude: NOAA Marine Debris Program, SECOORA, COSEE-SE, Gray’s Reef of the NOAA’s National Marine Sanctuary Program, US Navy, US Fish and Wildlife Service’s Coastal Program, National Park Service-SE Coastal Network, SC Dept. of Health and Environmental Control, Policy and Planning Division, NC Sea Grant, and The Ocean Conservancy. And more to come! We will be officially posting members on the website once the full Consortium is formed. Thanks to all our members for their support! SEA-MDI is nearing completion on a mobile phone application for Android, iPhone and Blackberry that will allow you to log and view marine debris that you find – anywhere! The app is called Marine Debris Tracker and we are working hard to get the Android version and web interface complete as soon as possible. Stay tuned! We are in the process of talking to people interested in joining our consortium. Formal invites are going out soon and we will have a full group in place in early December. These are exciting times as we begin to create this regional effort to address marine debris issues in Georgia, North Carolina and South Carolina! Dr. Jenna Jambeck of the Faculty of Engineering at the University of Georgia is conducting a research project to find the “average” weight of marine debris items. She needs your debris. If you are willing to donate debris, see her blog post for more information.